It's 6 a.m., sun at a new angle. I'm here to get a leg up on all the work on the table. What to do first? Write a blawg post! It's not procrastinating, I'm gathering my thoughts. Smiley face icon. Thinking about the state of things in this little studio. There are four of us in here now, inexplicably, and we're looking for another. It's active. When Mark joined in November we knew we'd start by focusing on nothing but Timbers. "F*cking killing it on the Timbers," I believe is the term we used. Then we'd think about what was next. We talked about the future a little, about where we thought we'd create value. We made a letterpress print of a design Aaron and I originally had created for Wikipedia, and sent it to a hundred people whose work we admire, including current clients. That was December. We've been pounding on Timbers ever since. Now it's deep Spring, the Timbers have been sold out every game since the opener, we're thinking about next season, and talking to four or five groups about beginning a new relationship. We are blessed, and it's sort of overwhelming. The new relationships feel like they have much potential. One is an old friend, another new friends, one is a 110-year-old Portland family business, one a dream that started as an unknown recipient on the mailing list of our story prints. Not sure what will happen or how we'll get it all done. A good time to take a breath. Thinking about where we thrive. Thinking about the studio's purpose. Thinking about how we work with clients best, what sort of relationships work. Thinking about where our heart is. Thinking about story. Always thinking about story. I got super excited about the tree model from the previous post. Seemed like it had a lot right about it. Love the root system as a brand foundation. It's all about the roots. Shared an earlier version of the model with three of my mentors, Mark Barden, Brian Lanahan and Thom Walters. Instead of roots, I had history. Brian and Mark both suggested I change it to roots. "Roots includes not just history, but your connections to the earth, to the community, everything you do and are and have been," Mr. Barden said. "All of it. It's the foundation of everything." Still, Mark Jacobs in studio thought something wasn't quite right about the model. I wanted him to be excited but he wasn't. "Isn't the whole thing the story? Not just that section." Yes. It's the whole trunk, from tip to bottom of tap root. He added, "It needs a name, or something. What is it?" And I felt something wasn't exactly right about the model, too. Too linear. So here's v. 3.0, drawn the other day. The drawing's a little weird. Masonic alien crop circle. But I like something about it, too. I changed the size of the words for emphasis. Story is now about the whole trunk, and even roots. I changed Actions back to Value, a word I've also used to stand for how you show up in the world, the value you create, how you enrich the world, how the world can see you and touch you. A branding genius visited the studio the other day, and he saw the drawing on the wall, and it resonated for him. Maybe because he has a tree in his logo. Also because he has a clear vision, and strong roots, and he brings it all, every day. The world might not always see or think about your vision or the roots, but they see the value you create. "It's all about that fat part of that tree," the branding ninja said. We named the model, "Deep story." Mark likes it. I do too. The world is hungry for deep stories. What is your deep story? How is it most powerfully expressed? That's where we're beginning, with all of these new relationships. Later this morning I'm driving into the country with the CEO and founder of one of these new clients. We're driving to his family farm, to drink wine from his family's vineyard and see and touch his roots. Hope it helps because at this moment I'm not sure I have a clue on how to express his story. And with that, back to the table. Thanks, blawg readers. Have a nice one. I think this is a great model for any type of organization. It spells out what's important and the relationships these pieces have with one another. I might use this as inspiration/talking for a current branding project the architecture firm I'm working with is going through. Thanks. I've since changed the third one to "presence," how you present your purpose and vision to the world. How your vision and purpose show up and are seen and experienced by the world. 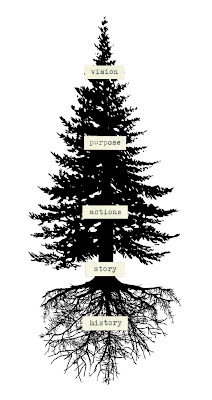 This is a great model but, speaking as a brand background, I see the smallest part of that tree as the most important. The story for me is the most critical. Without it, you can't focus on the top of the tree. Yeah, good catch - I've since called/labeled the whole model "deep story. "The story is the whole thing, from vision to purpose to presence to roots. The integration is really what makes it a deep story.